You’re best known for being the visual artist for Hawkwind. That’s quite a job! How long have you been working with them, and how did you land the gig? I’ve been part of the Hawkwind family since 2002. 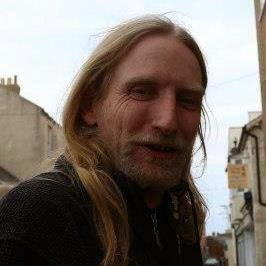 I started helping out a couple of friends (Neil Ward and Marie Jenkinson) in the mid 90’s doing shows for Hawkwind’s ex bassist/vocalist Alan Davey’s band, Bedouin, and their current vocalist Mr Dibs’ band Spacehead before getting the call from Hawkwind. Can you explain how you design your projections, and how you work them live? I use a program called Adobe After Effects to create new graphics and a program called Arkaos Grand VJ to run them live, which gives me the freedom to use the effects in live time. The work and discoveries of Albert Hoffman is a huge influence. Do you analyse the lyrics of a song when creating the visuals, or do you focus more on the music itself? Both inspire me but the tempo and feel of the music is the main thing I try to concentrate on. Do the artists have much input on your light show, or do you design it all yourself? 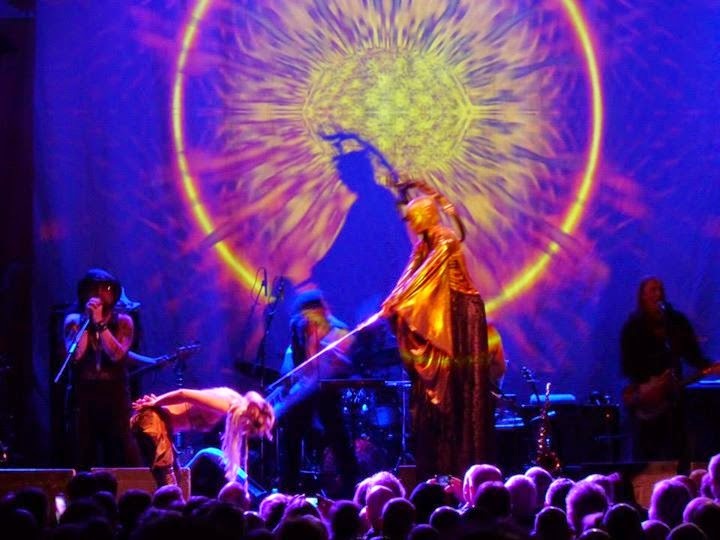 I design the Hawkwind show myself; they have had a little input in the past but it’s generally left down to me. The other bands I work for have had a lot more input, i.e. they provide the clips they want to use and I put them together. How long does it take to design the visuals to each song? Wow – how long is a piece of string? Haha, seriously though, sometimes it’s a matter of minutes, other times it takes days depending on if I’m on a creative streak or not. Are you influenced by anyone else in the world of lighting and projections? I guess the work that Optikinetics do creating the old school projection effects was/is still a big influence on what I do nowadays. My first influence I guess was the work Marie and Neil were doing when I first got involved in the graphics side of things. What equipment do you take on the road with you? Up until a few years ago we used to tour with the oldschool opti projectors Solar 575’s and Opti K4’s etc, and a video projector. It used to fill a Transit sized van. Nowadays I generally tour with just a projector and laptop – technology has come on in leaps and bounds nowadays so it makes it a lot easier to do what we used to do with less equipment. 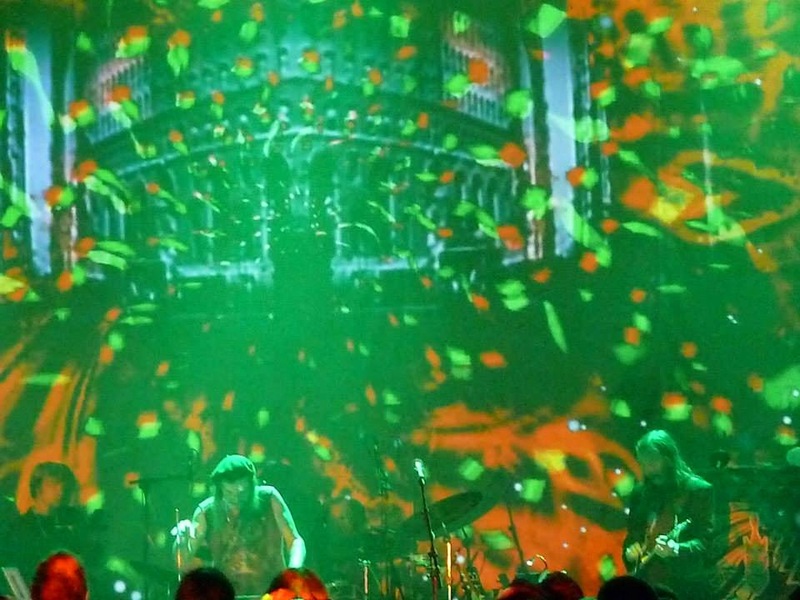 You’re also doing the light show for Electric Wizard these days, how did that come about? It was a case of knowing someone who knew someone who knew me haha. 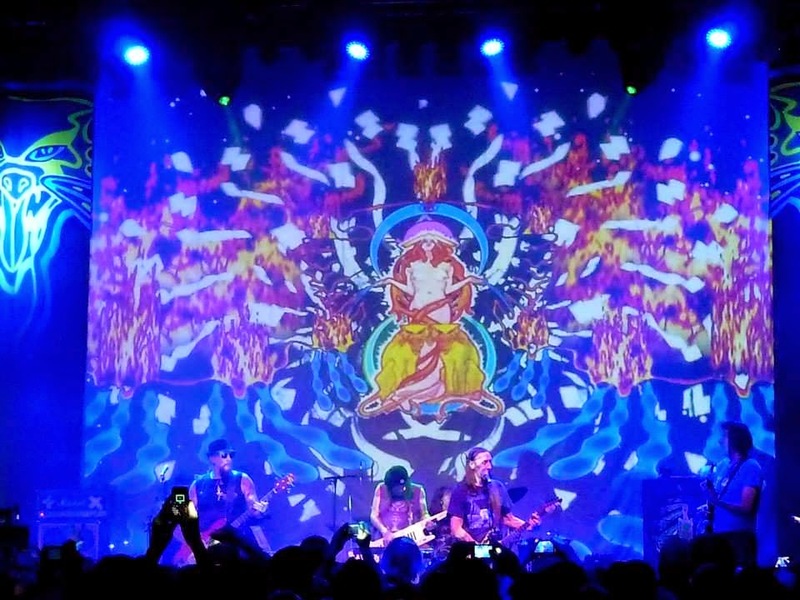 They wanted to create a new depth to their live shows and decided on a trippy doom graphics show. Their tour manager at the time knew a mutual friend called Keith Barton, who was at the time Dave Brock’s (Hawkwind) guitar tech, who put them in touch with us. 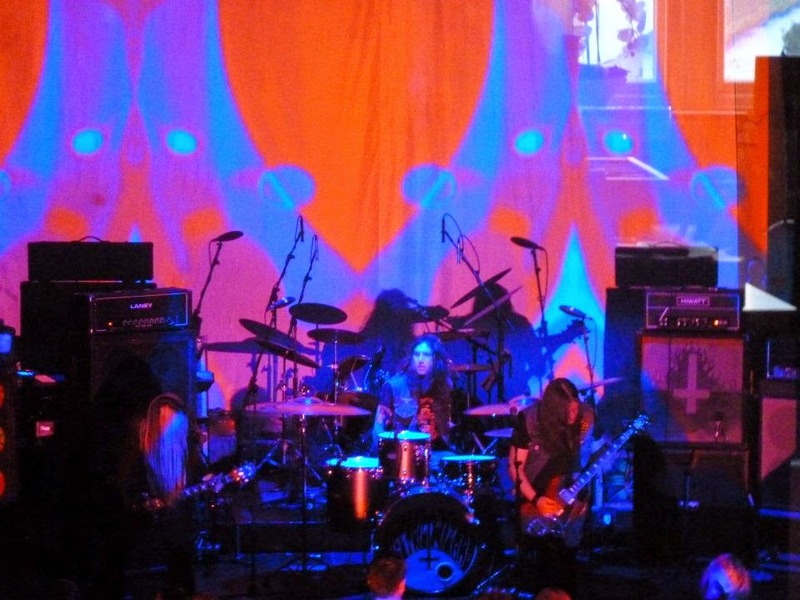 Both Hawkwind and Electric Wizard are associated with certain ‘drug cultures’. Do you think people need to be high, or tripping, to get the most out of the audio-visual experience when watching these bands live? I guess it helps. It certainly worked for me when I used to go and see them live before I got involved with working for them. Whereas Hawkwind have more of a peaceful ‘good trip’ vibe about them, Electric Wizard represent the bad trip, utilising your projections to convey the aesthetic of horror. How do you go about creating such contrasting effects for different bands? Haha peace n’ love man (what’s that all about then?!!!). I guess we all need a little lightness and darkness in our life, the Yin Yang philosophy. I guess their music dictates what sort of atmosphere is created. In my own mind and imagination there is very much a light and dark side so it’s pretty easy for me to transcend into both worlds. 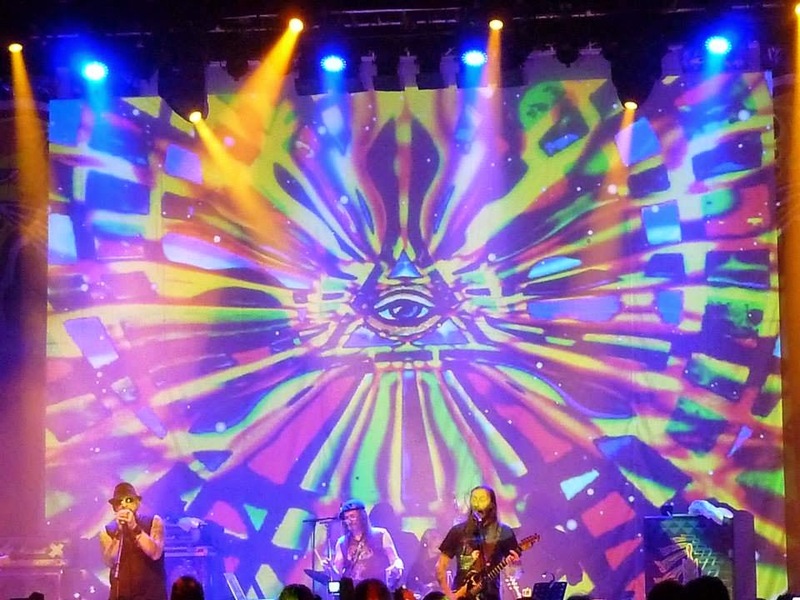 What’s YOUR favourite Hawkwind song? That’s a hard one. My favourite years are the mid 70’s with Lemmy and the early 90’s when it was the trio of Dave (Brock), Richard (Chadwick – drums) and Alan (Davey – bass). So I guess from the 70’s it’ll have to be Kings of Speed and from the 90’s it’s got to be LSD. You’ve worked a lot of tours and shows all over the world. What have been your career highlights? Each and every show is a highlight. There was a show in the south of Spain which will probably be a personal highlight for me haha, but I feel blessed to have experienced some wonderful shows and festivals in my career. As well as Hawkwind and Electric Wizard, you’ve worked lightshows for avente garde metallers Arcturus and more recently, ambient house pioneers The Orb. Are there any other bands you’d like to work for? I’d love to do some graphics work for Monster Magnet. I’d also like to experience what life on the road with Rammstein would be like (I used to work for a local band in the 80’s using pyro), so would love to play with Rammstein’s fire and pyro show haha. Is there anything you’d like to say to fans of your lightshow, or anyone aspiring to get involved in chaos of psychedelic visuals? DON’T DO IT! No, seriously, I just do what I feel like doing for the shows; your imagination is your only barrier. If you think it looks good then other people probably do too. To all the folk out there who enjoy what I do… thanks for your support and I’m glad you like my psychedelic warped imagination. "The works and discoveries of Albert Hoffman" brilliant answer! Nice one John, proud of you, mate. Top chap John...enjoyed this read. Thanks to you too Haz.